SteelSeries showed up at this year's CES bearing the gift of a brand new mouse, the Rival 700. Steelseries claims it's the first-ever gaming mouse with a fully customizable onboard OLED display that will allow you to track stats, change profiles, see CPI settings, and set custom logos and animations. In addition, the mouse can generate tactile alerts, warning you of in-game events such as cooldown timers or your health status, without affecting the accuracy of the sensor. 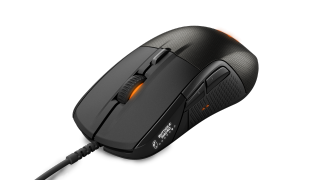 The Rival 700 also has a swappable cover that can be switched to ones with different designs and surfaces, and swappable sensors so you'll be able to change to the newest sensors when they come out rather than buying a whole new mouse. The surfaces bit is intriguing: ideally we'll be able to replace bits of the mouse once the mouse has soaked up a few years of sweat, or pick between smoother and grippier materials. The Rival has seven buttons and a soft-touch surface with sculpted side grips, along with double-shot injected left and right buttons. The Rival 700 comes with a 3ft rubber cable and a 6ft braided cable. The OLED-equipped mouse will be available this Spring for $100 / €110, and optional sensor and mouse covers will become available around the same time.